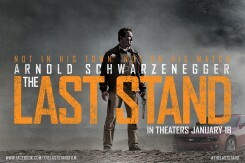 "Governator Ah'-nold" is back. This R-rated action flick is targeted strictly for the fans of R-rated action flicks; I was surprised to discover that I am one of them! This fast-paced bullet-riddled comedy is entertaining from the first frame. I've never laughed through a bloody shoot-out before but our screening audience had a great time. Korean director Jee-woon Kim ("The Good, the Bad and the Weird") brings his chop-socky experience and great sense of humor to the screen with non-stop, cliché-ridden energy. * Arnold Schwarzenegger ("The Expendables") is a weary sheriff in a little bitty (fictitious) Arizona border town, just putting in his time until retirement. He saw enough action in Los Angeles and was tired of blood, so he has moved here to relax. * Luis Guzman ("Journey 2: The Mysterious Island") is his chief deputy. He's not a coward, but he IS a realist, so when they hear that a high-powered jefe from a drug cartel is headed their way, he's thinking maybe they could look the other way "for a little while..."
* Zach Gilford ("Crazy Kind of Love") is one of our hero's hapless deputies. The first thing he does is break his nose while target shooting because he doesn't expect a high-caliber pistol to kick. * Jaimie Alexander ("Thor") is another deputy, scared spitless, but game. * Johnny Knoxville (Lots of TV) is one of the local yokels who volunteers to help our hero; but this gun lover INSISTS on being deputized. I laughed at his metal military helmet dangling on a rope as he is helped to cover. * Eduardo Noriega ("Blackthorn") is that aforementioned jefe, driving a singularly designed Corvette muscle car with rare skill. He is smart, tough and determined. * Forest Whitaker ("Repo Men") is with the FBI; the stunningly clever jailbreak happens on his watch and he WILL bring back his prisoner, the most wanted drug kingpin in the Western hemisphere. * Genesis Rodriguez ("Casa de mi Padre") is a lovely FBI agent taken hostage by that nasty escapee. We have many memorable thugs, a wonderful assortment of townspeople (some of whom have great reasons to stay in the diner), muscle cars, great use of a corn field, unlimited firepower, lots of blood, several humorous through lines that pop up at just the right moment, one little kiss and some appropriate profanity. I'm putting this one in my Guilty Pleasure file.